One example of an obstacle that drivers may come across is a pothole. If the tire is not properly inflated, then this might impact the wheel in a way that can knock it out of alignment in an easier way. However, a properly inflated tire can protect against that. A properly inflated tire can also help you avoid dangerous blowouts. 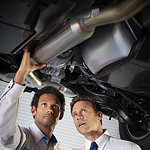 If you need help or tools when it comes to keeping the tire inflated, then visit a trusted auto service center. You will find plenty of tools that are going to help with what your tires.